Bus from Teluk Intan to Butterworth is the most reliable and economical mode of transport travel between two cities. The direct bus service from Teluk Intan to Butterworth save passengers time from travel to Ipoh for bus and train. Transnasional is the only bus operator serving bus from Teluk Intan to Butterworth. Transnasional is not just the government bus company, but also the leader bus operator in Malaysia. They offer quality, enjoyable and comfortable bus journey for their passengers. Transnasional offers up to 6 daily departures for bus from Teluk Intan to Butterworth between 8:30am to 6:30pm. The bus fare from Teluk Intan to Butterworth is charged at RM 23.70 for adult and RM 17.80 for child. Duration required for bus from Teluk Intan to Butterworth takes about 3 to 3.5 hours, depending on traffic and weather conditions. Washroom break will be given upon request from the driver during the journey. The pick-up point for bus from Teluk Intan to Butterworth is at Stesen Bas Bersatu Jln Mahkota. This is the old bus station located in the old town Teluk Intan, directly opposite the Shell Petrol station. Passengers are not to confused with the new bus terminal. The drop off point for bus from Teluk Intan to Butterworth is at Penang Sentral Bus Terminal in Butterworth. 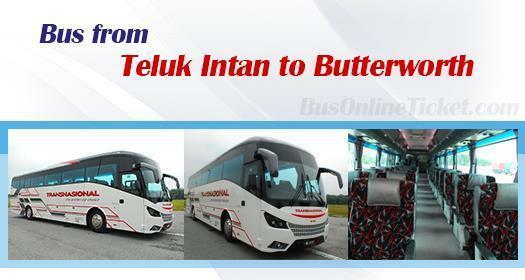 Hurry up and grab your ticket for bus from Teluk Intan to Butterworth from BusOnlineTicket.com now. Online booking in BusOnlineTicket.com is simple and convenient. Now it is even more convenient by booking bus ticket online at BusOnlineTicket.com with instant confirmation.